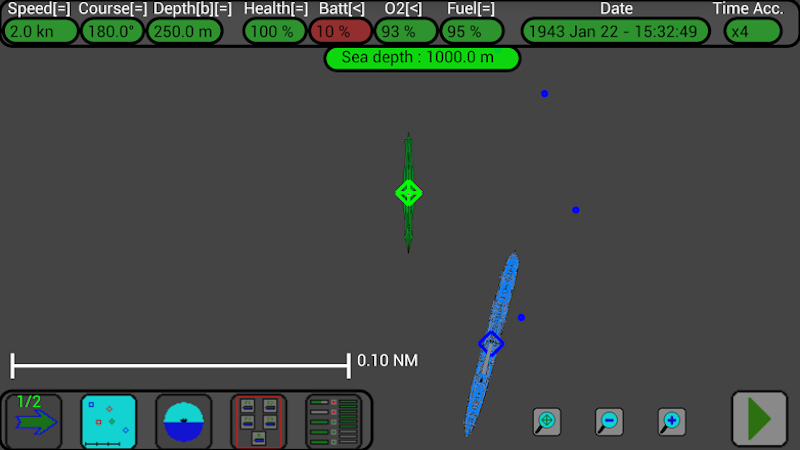 Here’s U-13 creeping along 250 meters with dying batteries. We can’t surface to recharge because we’re under a carrier’s fighter cover. We’re also getting depth charged by our own destroyer. I think we’re going to stop and wait for darkness for the area to clear, surface, and recharge the batteries. Steady boys, we’ve been through worse. We’ll be out of here soon. Your message was received and we are sending other supporting destroyers to help you in the hunting of the enemy submarine. But be extremely careful, also the friendly U-Boat U13 was reported in your area, we lost all contacts with its captain Harriman and perhaps he is waiting at a big depth, below your Z19. We repeat, pay attention, stop your attacks and be ready to assist him when he will surface.